Over the six months after assignment of ratings, funds rated Gold (Silver) experience an average investment flow 4.2% (3.4%) higher than funds rated Not Recommended. 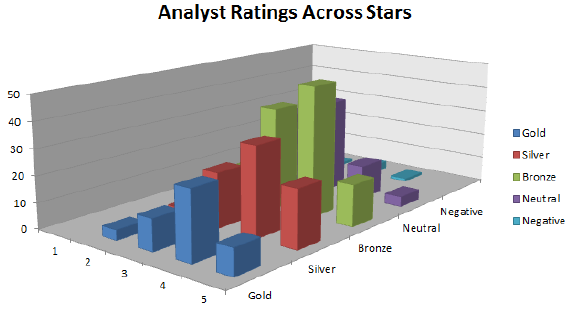 This influence of analyst ratings concentrates in funds with star ratings of four or five. There is little evidence that analyst ratings identify outperforming funds at horizons up to six months. Using either average raw returns or average alphas, Gold, Silver and Bronze funds do not significantly outperform Not Recommended funds at horizons of one, three or six months. At some horizons, Not Recommended funds significantly outperform Gold and Bronze funds. For example, at a three-month horizon, Not Recommended funds have an average raw return (alpha) 1.52% (0.08%) higher than that for Gold funds. After adjusting for fund characteristics such as net assets, expense ratio and turnover, there is no evidence that Gold and Silver funds have higher average alphas than Not Recommended funds, or that Gold funds outperform Silver or Bronze funds. Equally weighted and monthly rebalanced portfolios of recommended funds do not outperform a portfolio of Not Recommended funds. The following chart, taken from the paper, summarizes the relationship between Morningstar’s substantially qualitative analyst ratings and strictly quantitative star ratings. It shows that the two rating systems differ. Funds with four stars have a disproportionately large share of Gold, Silver and Bronze ratings. Funds with three stars have a disproportionately large share of Neutral and Not Recommended (Negative) ratings. In summary, evidence to date offers little support to a belief that Morningstar analyst ratings predict future relative performance of mutual funds on either raw or risk-adjusted basis. As noted in the paper, fund performance measurement intervals are much shorter than a full market cycle as contemplated by Morningstar in the design of analyst ratings. Data are not available for market cycle analysis. The study does not discover any way for investors to identify funds likely to outperform.